These units offer many more advantages than conventional boosters, while maintaining the same basic simplicity. The pre-fill booster has two automatic cycles. 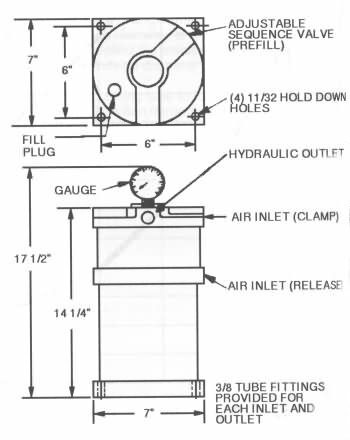 The first cycle pre-fills the work circuit using low pressure with a large reservoir to provide volume. The second cycle then automatically provides high pressure, as needed. These units also provide automatic bleeding of the work circuit. This self-bleeding feature negates the need to “bleed the lines” after it is set up. The pre-fill booster is ideal for any general use production system requiring maximum efficiency with minimum effort! Pre-fill boosters must be used in the upright (vertical) position.